Józef Kalinowski was born on September 1, 1835, in the city of Vilnius—an area known at that time as a Russian partition, though it had formerly been part of the Polish-Lithuanian Commonwealth. He was a teacher, engineer, prisoner of war, royal tutor, and priest, who founded many monasteries around Poland after the suppression by the Russians. He was the second son of Andrew Kalinowski (1805–1878), an assistant superintendent professor of mathematics at the local Institute for Nobles (Instytut Szlachecki). His mother, Josephine Polonska, died a few months after he was born, leaving him and his older brother Victor without a mother. His father then married Josephine's sister (a practice that was not uncommon in that time), Sophie Polonska, and had three more children: Charles, Emily, and Gabriel. After Sophie died in 1845, Andrew married again, this time to the 17-year-old Sophie Puttkamer, daughter of Maryla Wereszczak (famous at the time for being written about by Adam Mickiewicz), who became mother to all of Andrew's existing children and had four more of her own: Mary, Alexander, Monica, and George. From the age of 8, Kalinowski attended the Institute for Nobles at Vilna, and graduated with honors in 1850. He then went for two years (1851-1852) to the school of Agriculture at Hory-Horky. The Russians strictly limited opportunities for further education, so in 1853 he enlisted in the Imperial Russian Army and entered the Nicholayev Engineering Academy (Mikolajewska Szkola Inzynierii). The Army promoted him to Second Lieutenant in 1856. In 1857 he worked as an associate professor of mathematics, and from 1858-1860, he worked as an engineer who helped design the Odessa-Kiev-Kursk railway. In 1862 the Imperial Russian Army promoted him to Captain and stationed him in Brest, Belarus, but he still sympathized with the Poles. He consequently resigned from the Imperial Russian Army in 1863 to serve as minister of war for the January Uprising, a Polish insurrection, in the Vilnius region. He determined never to sentence anyone to death nor to execute any prisoner. When the Poles rose against the Russians in 1863, Raphael joined them and was soon taken prisoner and condemned to death by firing squad. His family intervened, and the Russians, fearing that their Polish subjects would revere him as a political martyr, commuted the sentence to 10 years in a Siberian labor camp. They forced him and the other prisons to trek overland to the salt mines of Usolye-Sibirskoye near Irkutsk, Siberia, a journey that took nine months. Very few survived this march, but Raphael was sustained by his faith. With an admirable strength of spirit, patience, and love for his fellow exiles, he instilled into them the spirit of prayer, serenity, and hope, and gave them material help together with encouragement. He was released ten years later in 1873 and was repatriated on March 24, 1864. Kalinowski returned to Warsaw in 1874, where he became a tutor to 16-year-old Prince August Czartoryski. The prince was diagnosed with tuberculosis in 1876, and Kalinowski accompanied him to various health destinations in France, Switzerland, Italy, and Poland. Kalinowski was a major influence on the young man (known as "Gucio"), who later was received into the Salesians by their founder, St. John Bosco, in 1887, and was eventually beatified by St. Pope John Paul II in 2004. Later Kalinowski decided to travel to the city of Brest where he began a Sunday school at the fortress in Brest-Litovsk where he was a captain. At this time, he became increasingly aware of the state persecution of the Church and of his native Poles. In 1877 Kalinowski was admitted to the Carmelite priory in Linz, Austria, where he was given the religious name of Brother Raphael of St. Joseph, O.C.D. (NOTE: The name "of St. Joseph" had nothing to do with his birth name—it was common for many Carmelites to list their name as "of St. Joseph," after the "Convent of St. Joseph" founded by Teresa of Avila.) He studied theology in Hungary, and was ordained a priest at Czerna near Krakow, on January 15, 1882. In 1883 he became prior of the monastery at Czerna and eventually founded multiple Catholic organizations around Poland and Ukraine, most prominent of which was a monastery in Wadowice, Poland, where he was also prior. 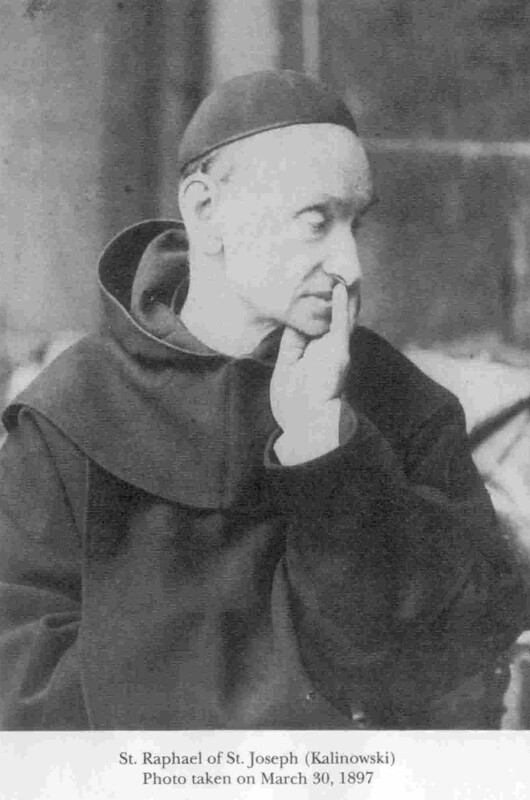 He also founded a monastery of Discalced Carmelite nuns in Przemysl in 1884, and Lvov in 1888. Afire with apostolic zeal, he did not spare himself in helping the faithful, and assisting his Carmelite brothers and sisters in the ascent of the mountain of perfection. In the sacrament of Reconciliation, he lifted up many from the mire of sin. He did his utmost for the work of reunification of the Church, and bequeathed this mission to his Carmelite brothers and sisters. His superiors entrusted him with many important offices, which he carried out perfectly up until the time of his death. Fr. Kalinowski died of tuberculosis on November 15, 1907, in the same monastery he founded himself in Wadowice. His remains were originally kept in the monastery cemetery, but this proved unmanageable because of the large number of pilgrims who came visiting. So many of them took handfuls of dirt from the grave that the nuns had to keep replacing the earth and plants at the cemetery. His body was later moved to a tomb, but the pilgrims went there instead, often scratching with their hands at the plaster, just to have some relic to keep with them. His remains were then moved to a chapel in Czerna, where they remain. During his life and after death, he enjoyed a remarkable fame for sanctity, even on the part of the most noble and illustrious of people, such as the Cardinals Dunajewski, Puzyna, Kakowski, and Gotti. The Ordinary Process for his eventual beatification, was set in motion in the Curia of Krakow during the years 1934-1938, and later taken to Rome where in 1943 was issued the Decree concerning his writings. His cause was introduced in 1952. From 1953-1956 the Apostolic Process was carried out, and the Congregation proceeded to the discussion on his virtues. St. Pope John Paul II, on October 11, 1980, promulgated the Decree on the heroicity of his virtues. After the approval of the miraculous healing of the Reverend Mis, the Holy Father beatified Fr. Kalinowski on June 22, 1983, Kraków, in front of a crowd of over two million people. As the fame of his miracles was increasing, the Curia of Krakow in 1989, set in motion the Canonical Process to investigate the extraordinary healing of a young child. The discussions of the doctors, theologians and cardinals, were brought to a happy conclusion. On November 17, 1991, he was canonized when, in St. Peter's Basilica, St. Pope John Paul II declared his boyhood hero a saint. 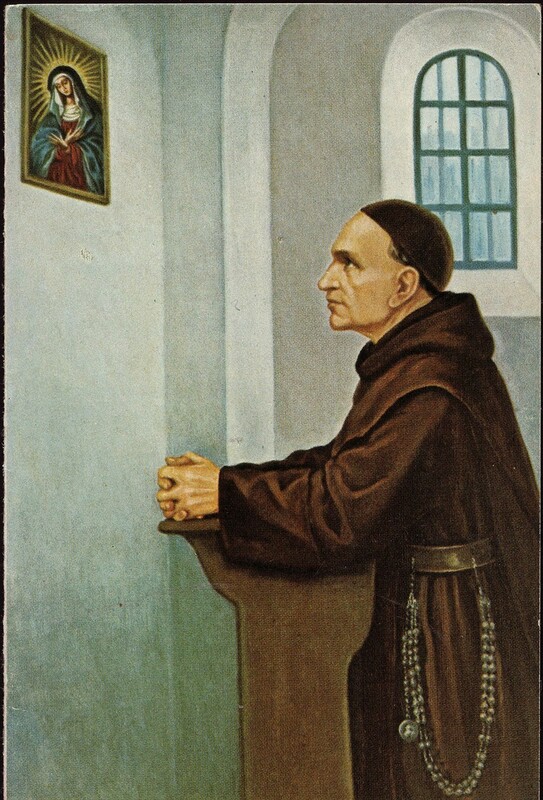 Raphael was the first friar to have been canonized in the Order of the Discalced Carmelites since St. John of the Cross. His feast day is celebrated on November 19 in the Discalced Carmelites order and on November 20 by the Catholic Church in Poland.